"Amir" redirects here. For the name, see Amir (name). For other uses, see Amir (disambiguation). 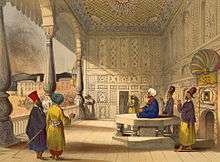 The court of the Durrani Emirate of Afghanistan in 1839. Emir (/əˈmɪər, eɪˈmɪər, ˈeɪmɪər/; Arabic: أمير‎‎ ʾAmīr [ʔæˈmiːr]), sometimes transliterated (olowan, Datu in Meranau common version) Amir, Amier, or Ameer, is an aristocratic or noble title of high office used in a variety of places in the Arab countries and Afghanistan. It means "commander", "general", or "prince". The feminine form is Emira (أميرة ʾAmīrah). When translated as "prince", the word "emirate" is analogous to a sovereign principality. Amir, meaning "Lord" or "commander-in-chief", is derived from the Arabic root a-m-r, "command". Originally simply meaning commander-in-chief or leader, usually in reference to a group of people, it came to be used as a title for governors or rulers, usually in smaller states, and in modern Arabic is analogous to the English word "prince". The word entered English in 1593, from the French émir. It was one of the titles or names of the Islamic prophet Muhammad. The monarchs of UAE, Qatar and Kuwait are currently titled Emirs. 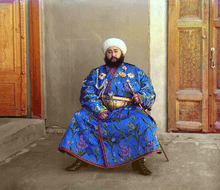 The caliphs first used the title Amir al-Muminin or "Commander of the Faithful", stressing their leadership over the Islamic Empire, especially over the militia. 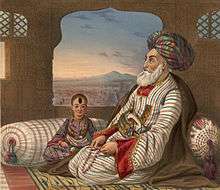 The title has been assumed by various other Muslim rulers, including Sultans and Emirs. For Shia Muslims, they still give this title to the Caliph Ali as Amir al Muminin. 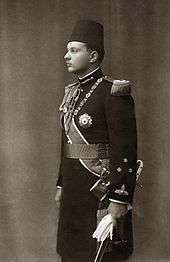 In Lebanon, the ruling Emir formally used the style al-Amir al-Hakim since, specifying it was still a ruler's title. Note that the title was held by Christians as well. Abdul Abulbul Amir, both character and song. Wat Tambor in Star Wars: Episode II – Attack of the Clones took the title of Emir. In the Star Wars universe the title may relate to Tambor's military command. Emir Karim, a character in Wild At Heart, a Latin American drama.